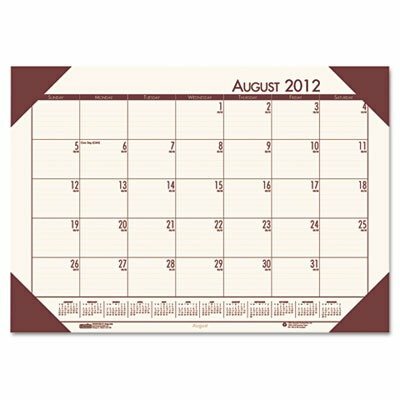 House of Doolittle EcoTone Academic Desk Pad Calendars are available in three colors, with 12 months August 2010 to July 2011. This unique size of 18.5" x 13" with reinforced 4 corner holder is perfect for the smaller work space. Other Academic products for the teacher or student from House of Doolittle includes desk pads, wall calendars, lesson planners, class record books, assignment books, monthly appointment planners and weekly appointment planners. Go GREEN with House of Doolittle products, we use 100% recycled paper containing 100% post-consumer waste with soy inks. All of our products are manufactured right here in the USA. Since 1989 House of Doolittle has donated 5% of its profits to organizations that are working to create a more sustainable environment.